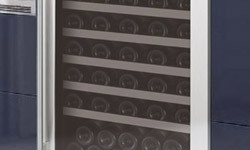 Allavino's all-new Single Zone Wine Cooler Refrigerator is an ideal choice for storing a diverse collection of up to 177 bottles of red, white, or sparkling wine. 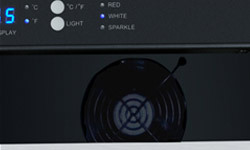 A digital display and indicator lights allow you to monitor the temperature at a glance, and push button controls make setting the refrigerator to the optimum conditions quick and easy. 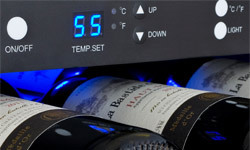 The FlexCount Series wine refrigerators also feature revolutionary new shelves that are strong enough to provide reliable stability and prevent sagging, yet thin enough to allow more space between the shelves than you will find in most similarly sized wine refrigerators, allowing you to store larger bottles without sacrificing bottle capacity. 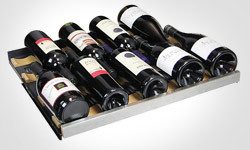 These shelves are accented with stainless steel fronts, and have wood slats that cradle your bottles to help prevent harmful vibration from affecting your wine. This front-venting refrigerator can be built-in to provide a seamless look to your kitchen, or used as a stylish freestanding unit with finished sides and top. 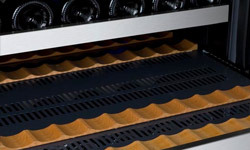 The VSWR177-1SSRN features 10 shelves that can hold up to 11 bottles each, 2 shelves that can hold up to 20 bottles each, and a top shelf that can hold up to 27 bottles for a maximum bottle capacity of 177 bottles. 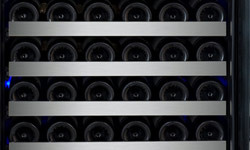 The maximum capacity can be reached with many different bottle sizes and is only affected when adding in larger Pinot or Champagne bottles.